CTV Television Network (commonly referred to as CTV) is a Canadian English language television network. 1967–1974: "It's Happening on CTV"
1974–1985: "For Those Who Want It All"
1987–1988: "You'll See it All on CTV"
1988–1989: "The Choice of Canadians"
1989–1990: "Watch Yourself on CTV"
1990–1994: "Tuned In To You"
Since the 2007 acquisition of A-Channel by CTVglobemedia as part of the takeover of CHUM Limited, media analysts had speculated that CTV may potentially extend its market-leading CTV brand to that network. It was first rebranded as "A" in 2008, then as "CTV Two" on August 29, 2011. 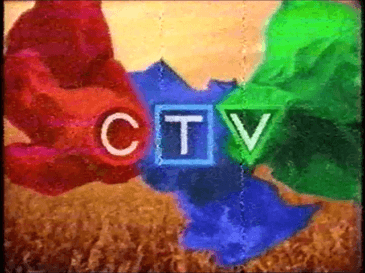 CTV logo, used from 1975-1985. The ribbons logo used from 1998-2011. CTV Television Network Facts for Kids. Kiddle Encyclopedia.